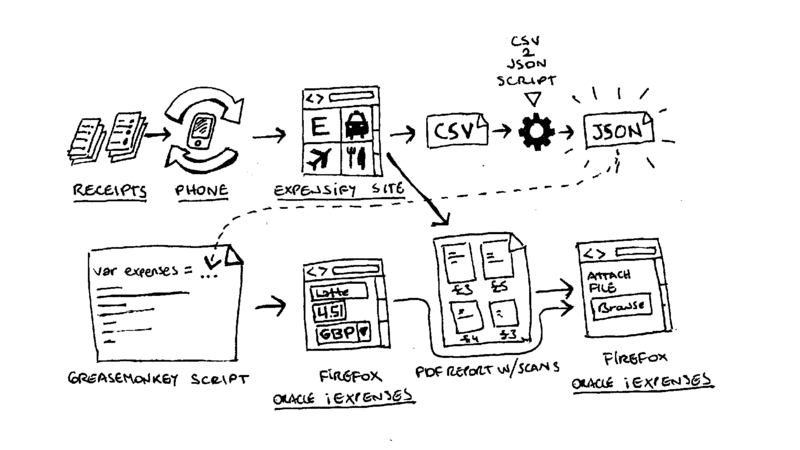 In this post I show how I automated my expenses using Expensify and Greasemonkey. There is nothing more frustrating than spending time dealing with expenses since it is an activity that adds zero value to our customers and contributes nothing to our personal development. In short, doing expenses is an utter waste of time. 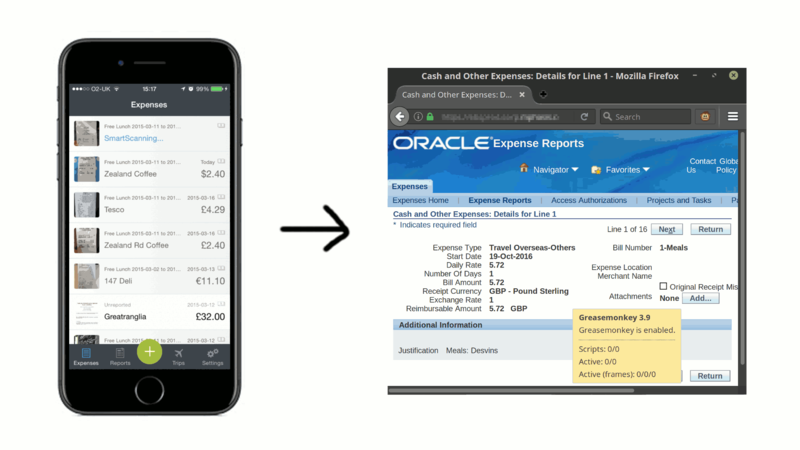 Some employers believe that they have an “expenses solution” because they run some sort of clunky web-based application such as Oracle iExpenses. Whereas in the past a regular employee would only need to hand over an envelope full of receipts, now he or she has to spend countless hours scanning them and entering their details on various forms. Thus, the use of a tool like iExpenses does not represent automation; it is merely shifting the expenses processing job from accountants to regular employees. Adam Smith would be turning on his grave if he knew we have learned nothing from his account on pin workers written three centuries ago. concat ["var expenses = [\n"
,if l then "" else ","
The next step is write a Greasemonkey script. This is the most difficult part since we need to understand what the target expenses web site expects and what are the identifiers of the various elements we have to interact with. Then I try to detect which page Oracle iExpenses is displaying since this appears to be maintained in the session and I cannot assign a different script for each page by using a URL pattern which is the default way of using Greasemonkey. This function populates the expense form “one at a time” as opposed to using the “bulk” editing form since the bulk editing mode skips mandatory fields. document.title = "You've reached the end of your expenses"
I haven’t automated the clicking of the “next” button since I am still tweaking the script and making sure that the form has been populated correctly. However, the script maps the line item numbers from Oracle iExpenses with those from Expensify so I don’t need to specify what record must be selected. After all expense line items have been entered, there is an of extra bulk form to match each line item with a cost centre and a task. This particular screen is annoying because it has pop-up windows that send refresh updates to the underlying page. After completing this screen, I attach the PDF report generated by Expensify which has all the scanned receipts. This is pretty much “it”. At the cost of frappuccino per month and less than 100 lines of code, we can free up weeks worth of time in a year that can be utilised for more productive endeavours.